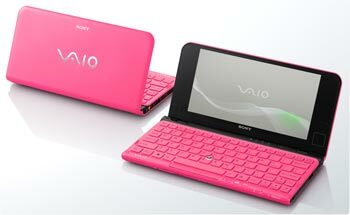 Sony VAIO 8inch Laptop in Pink! Scroll less and see the bigger picture with the 8-inch LED-backlit screen. Simply rotate it 90 degrees and your Web page, document, or photo instantly changes from landscape to portrait view, filling the entire screen. With portrait view, you can see and read more while spending less time scrolling up and down. Enjoying your photos and home videos has never been simpler with the uniquely smart and easy-to-use PMB VAIO Edition. Get instantly organized with smart sorting features, create personal masterpieces with one-click creative tools and share your favorites in two simple steps.